Making wine at home is a great way to better understand what makes a wine what it is. In fermenting your own grapes you will get an appreciation of how many very subtle factors affect a wines taste. You will in all probability also come to respect just how difficult it is to make a really good wine. Great wines are sometimes the product of centuries of research. Often soil and climatic conditions are calculated in minute detail. On the other hand – and this will depend on just how your wine turns out – it may help dispel some myths. You may just turn out with a decent product. With patience and some tweaking here and there some small scale producers in the UK produce some surprisingly good wines. This really is how the UK wine market started out – as a backyard enterprise. Unfortunately, unless you have plenty of time and access to a fortune, making your own wine in the UK invariably means either making English Country wines, that are arguably not really wine at all (such as Elderflower Wine, see related articles for info on such drinks) or making wines from grape concentrate: imported from abroad. This means that there are certain limits to how far the wine maker can go in adjusting the taste of their wine. Terroir and weather conditions, for example, cannot be experimented with in the same way as if you are fortunate enough to have a few of your own vines. 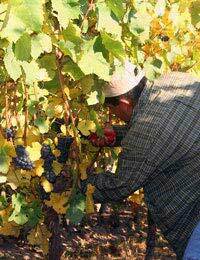 However, much can be achieved in the choosing and mixing of grape varieties. With time you may manage to produce something quite special. Home brewed wines have been known to have ‘blind’ tasters at competitions in raptures, whilst wondering which famous region the particular wine was from! To get started you will need some quality grape concentrate (which can be bought online) and a brewing kit. You will also need grape concentrate and grape juice (which can be bought to order) and some yeast. From here you merely need to place the grape concentrate and yeast in a sealed fermentation bucket (which will come with a brewing kit) and let the yeast do the work. The main and first rule is to keep all equipment 100% clean – any dirt will encourage bacteria that although harmless, will ruin the taste of your wine. There are makeshift ways to make wine, utilising emptied gallon water bottles, balloons and rubber bands, but be wary of these. You will likely set yourself up for a poor wine, and a lot of wasted time. Good ‘grand cru’ and premier cru’ kits can be bought, with grapes sourced from quality vineyards, enabling you to produce wine akin to high quality wines produced in the best regions of the world. It may be worth investing in such a kit, as it will ensure a much more positive outcome. The last thing you want is to spend time and money producing a wine, only to be left with several gallons of undrinkable vinegary plonk!